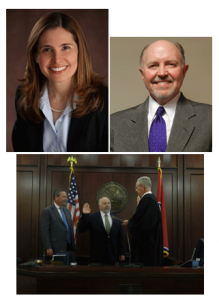 District Attorney Glenn Funk has announced three new appointments to the Office of the District Attorney, effective May 1, 2015. Attorneys Robert Jones, Leticia Mason and Investigator Randy Martin were sworn in Friday morning by Judge Steve Dozier. Robert Jones is a veteran trial attorney and previously served as Shelby County’s Chief Public Defender. Attorney Jones has more than 35 years legal experience and is a graduate of Memphis State University School of Law. As an Assistant District Attorney in Nashville, he will oversee prosecution of child abuse cases. Attorney Leticia Mason’s private practice specialized in immigration and civil law. She joins the District Attorney’s Office after having worked as a Spanish court interpreter for Davidson County Criminal Court and a staff attorney for the Mexican government. She is a graduate of Nashville School of Law. Investigator Randy Martin retired from the Metro Nashville Police Department in 2014 after 30 years as a police detective. He joins the DA’s Investigations Unit to assist in preparing cases for prosecution.